It has been a tricky time for us in Stephanie’s Kitchen Garden this month. The weather has certainly been providing us with some interesting challenges! 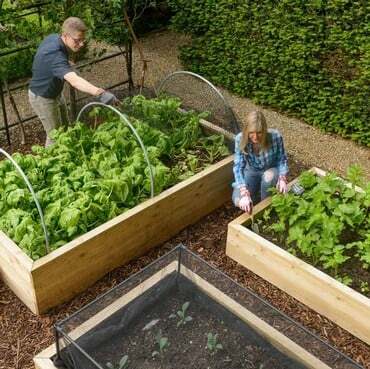 Tender crops have been slow to get going and have needed some extra care and attention. However, as the month draws to a close, it looks as though the summer may well have arrived here at last. Let’s hope it’s here to stay. Earlier in the month we planted out our sweet potatoes. This crop has become a firm favourite in the garden due to that fact that it looks amazing trained up an obelisk as well as providing a good crop. We grow it in a raised bed and train it up an obelisk. Summer visitors to the garden always comment on how good it looks. Sweet potatoes are a tropical crop and love hot temperatures, so have not been enjoying recent weather conditions. A few weeks on and the plants are still healthy, but have grown very little. Our beans, squashes and courgettes are also being held back by the cold start to summer. 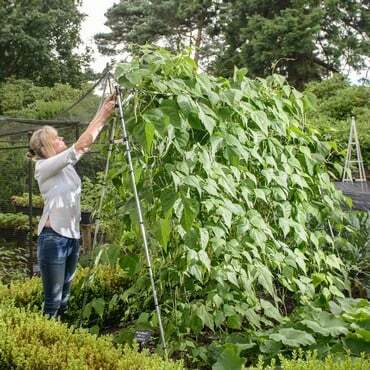 Our beans have been wrapped in fleece and this has kept them healthy and growing. They are now about half way up the bean frame, which isn’t as far on as we would normally expect from this time of year. 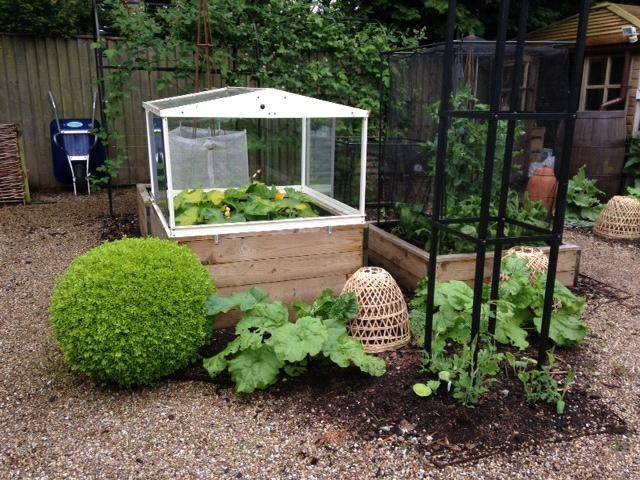 Our courgettes have been grown in our new raised bed cold frame, installed over the winter. This frame has been a god send and the plants are much further forward than other plants we have planted in the main beds in the garden. We have fruits forming and the plants are a really good size. Our squash plants have also been held back but these are under cloches which are giving them good protection and keeping them happy. It’s not all doom and gloom however. Our brassicas are amazingly lush and healthy and providing us with trugs full of broccoli and kale. Leafy crops have really enjoyed the cooler weather and we have been eating salads and spinach for weeks. The potatoes are also looking healthy and we have enjoyed delicious baby new potatoes. We have been harvesting tomatoes and cucumbers from the greenhouse for a couple of weeks now. Our tomato plants are already carrying trusses of large green fruits and today we have harvested large ripe beefsteak tomatoes. Our peppers and aubergines are also fruiting, and our chilli plants are setting flowers. Outside, our strawberries have lovely large fruits ripening, although the ones in our raised bed have been pinched by pesky mice. They were netted against bird attacks, but the mice got through. We quickly put up a chicken wire fence around the bed and set some humane traps outside it. We have caught 2-3 mice a day ever since. This isn’t a problem we have experienced with our strawberries before. Thankfully, the plants grown in strawberry tables in the fruit cage are untouched. 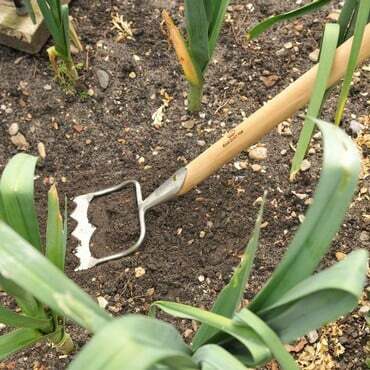 This month we have planted out our leeks. It was a little later than we would normally like to plant them, but they always follow our new potatoes into the ground and these are a little late being harvested due to the cold spring. The leeks are good size plants though, so should have plenty of time to grow before the winter. Jo used a garden line to make sure the leeks stand in neat rows, and then used a dibber to make a hole for each leek before watering them in. Now that the growing season is in full swing, it’s important to keep our crops well fed and watered. We like to use fish, blood and bone every six weeks on our leafy crops such as brassicas, spinach and chard, and seaweed feed on flowering crops such as courgettes and beans. Whenever rain is forecast we apply the feed to the soil and wait for it to be washed in. Of course the weeds have been enjoying the pampering as much as the vegetables so we are constantly busy with the hoe to keep them controlled. It doesn’t take long for them to take hold and set seed so it’s important to regularly hoe them off when they are very small. Our fruit trees are still enjoying a foliar feed of liquid seaweed and are thriving from it. Our bees have done an amazing job pollinating the trees this year and they are dripping in small fruits. 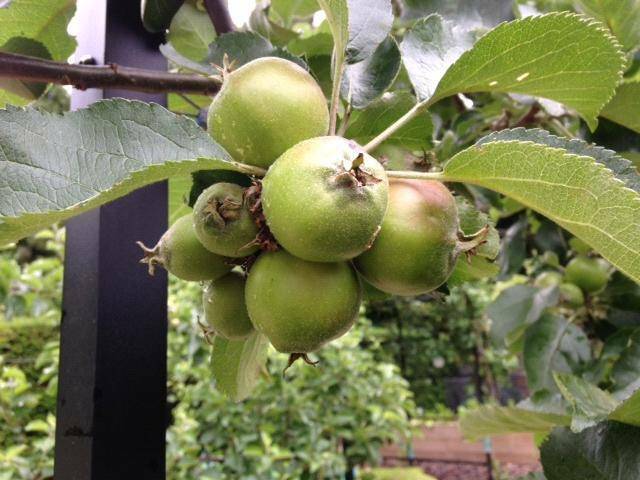 The June drop has removed many of them, but the espalier apple trees in particular are full of fruit. Late in June we thinned out the remaining fruits on the trees. Each group of fruits was thinned down to two to allow them room to grow to a good size. This can be a painful job, as you are removing perfectly healthy apples and pears, but it is a necessary evil. The main job of June has been the annual box hedge clip, traditionally carried out on Derby day. The cloudy cool conditions were perfect for this job. Our shears were sharpened and cleaned ready for the task and we used mats to collect the clippings. After clipping, the hedges were given a foliar feed of seaweed to help them recover. We have a lot of box hedging in the Kitchen Garden ad the surrounding grounds, so it takes us a good couple of week to complete. It’s always worth the effort as the transformation is stunning. Cut back excess leaves on tomatoes to let light to the fruit.